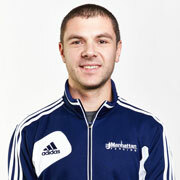 Sergey Isayenko has 17 years of competitive experience and 9 years of coaching experience. Sergey started fencing at the age of 8 in Ukraine. Throughout his fencing career, Sergey was a two-time National Champion (2002, 2004), two-time bronze medalist at Junior World Championships as part of Ukrainian national team (2000, 2001), and 2005 NCAA Champion as part of St John’s University team. During his coaching career Sergey prepared national champions on youth, cadet and junior level, and had several students that made USA cadet and junior national teams. He served as USA mens saber national coach for 2009, 2010, and 2011 junior/cadet world championships. Sergey was elected as USA Youth Olympic Games head coach in Singapore in 2010 were he led team USA to earn bronze medal. He received a Masters degree at the National University of Physical Education and Sports in Kiev, Ukraine.